How Much Love Is In It? This is true whether I am looking at a manmade object, a pet, a person or a plant. A thing, a dog, a human or even a beautiful rose could be a little on the low side, love-speaking. I am explaining because this goes to the core of how I think. I will take my hobby, jewelry making. Because I make necklaces, earrings and bracelets for a hobby, I spend a lot of time looking. Handmade jewelry. Store bought jewelry. High end, low end. Craft stores. Antique stores. Many store-bought objects are the equivalent of fast food. They have little to no chi in them – even very expensive items. They are so perfectly uniform they look almost ugly. The less energy a human hand put into them, the more lifeless and unattractive they are to me. My tai chi teacher, Jeff Cook, taught me a great phrase, wabi-sabi, which means, simply put, the beauty of imperfect things. Like nature. Nature is unpredictable but magnificent. It’s a Japanese term and goes to the heart of the artistic process – nothing lasts, nothing is finished and nothing is perfect. I remember once making a rose quartz necklace for one of my clients. I put great care and thought into it. Whenever I make jewelry for any person, I tune in to their energy and meditate about what exactly it is that they need at that time. I have learned the qualities of each stone and take that information into account as I meditate. Then I choose the colors, the stones, the length and start beading. I looked at that necklace many times and at the end it seemed just right for her. Then one day she wore it into my office. I noticed that one of the beads on one side was smaller than its mate on the other side. I was aghast! How did I not see this the first time? Or even the second, third or tenth time I looked? Even though it had been a gift, I offered to take the necklace back and repair it. This same lady hired me one year to make a necklace for her mother. I tuned into her mother’s energy and made a gorgeous, elaborate statement piece of green pearls. The necklace was considerable, but I heard back that because she had arthritis, the mother was having difficulty with the clasp and could not put it on all by herself. So I made another necklace for free. I sat down and tuned into my client’s mother’s energy. I decided she needed to heal her heart, so I chose all deep green stones that heal the heart, principally malachite and aventurine. The mother accompanied my client to a session, so I was able to present it to her myself as a gift. I had not seen the mother during this time or heard any news of what was happening with her. “How did you know?” the mother exclaimed. 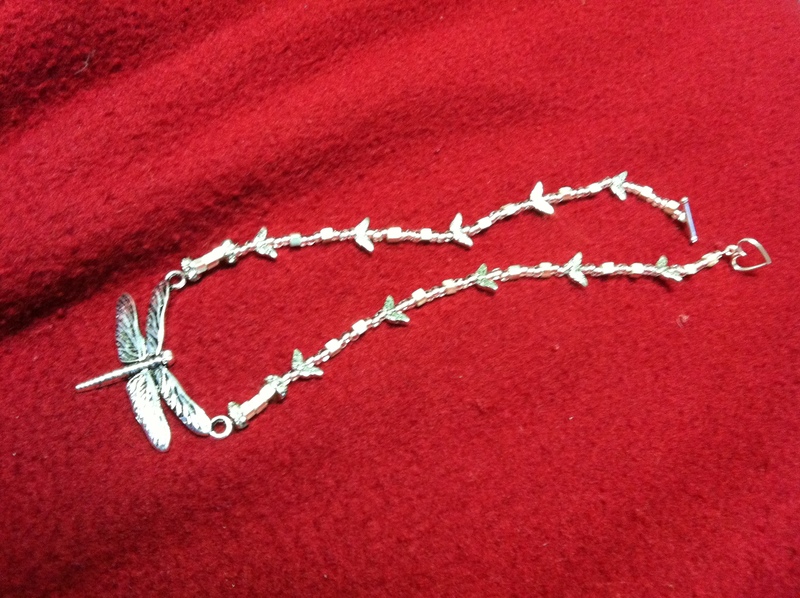 The clasp was very simple. She could do it all by herself. But more to the point, there was a lot of love in the object and she could feel it. My gardener, Gabe Horrisberger, has a green thumb. That might seem like a basic requirement for someone who is in his profession, but trust me, if Gabe puts a living thing into the ground, it will thrive. Sometimes I have run scientific experiments where I will put pansies in one part of my garden and Gabe will plant the others. I love my flowers very much, but whatever Gabe puts into the ground will do the best. He just loves gardens. I think to myself, “How hard can this be? You dig a hole and put the thing in the ground.” I use fertilizer and everything. Earlier this year, I went to one garden center. They had all the basic flora, but everything looked loveless. Then I went to ACE Hardware, around the corner from me. It’s a small place, unpretentious and slightly disorganized, but the cashiers are friendly, even the guys who put the bags of cedar chips in the back of my car are helpful and all the plants look like someone is actually interested in them. I buy flowers from ACE Hardware all the time, and whatever I get from that particular store will always thrive. Dr. David Hawkins, M.D., author of Power Versus Force, is my favorite writer. I have read virtually every book he has ever written, usually multiple times. Dr. Hawkins says whether or not a patient has side effects from any medication has to do with the intention of the doctor who prescribed the drug. He said that some doctors can prescribe virtually anything and their patients will have no side effects. That is because they have only love for their patients. A long time ago I remember being very touched by the words of Emilie Conrad, an off-the-wall genius healer, who, to my mind, has always been 30 years ahead of her time. She said, “YOU are the technique.” In other words, we can study all these techniques, but at the end of the day, it’s not the technique that makes the shift, it is our vibration, our intention and how much love we put into whatever it is that we are doing. When I visited Don Wetsel in Virginia, I was very touched that he, the teacher, asked me to work on his neck. He had taught the techniques for releasing pain in the neck and then he came to me to practice on him. He told everybody in the class afterwards that it was the first time in his life he felt he had his head on straight. When we touch another person with great love in our heart, everything is transformed. It doesn’t matter whether it’s homemade jewelry, homemade cooking or a garden.